A travel kit that looks great on the outside, with all the ingredients to make sure you do too. Instead of squeezing your favorite high-end toiletries into cheap, leaky tubes or settling for hotel freebies, treat yourself to a more convenient and comfortable experience next time you travel. 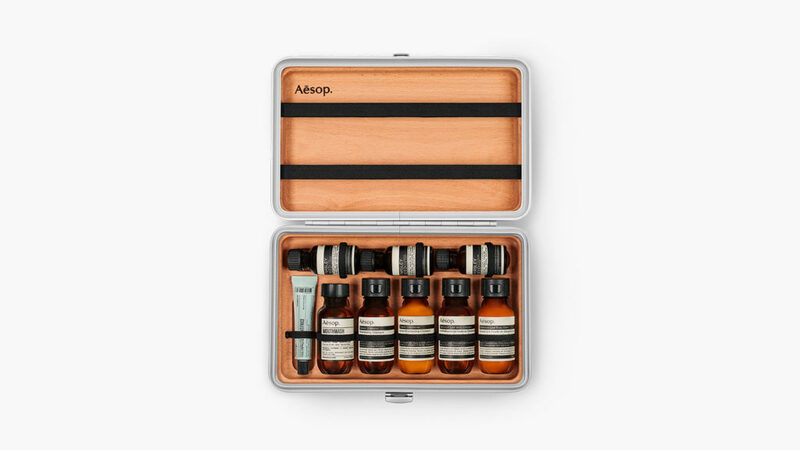 Luxury skin care brand Aesop just curated a collection of travel-sized skin, hair, and oral care essentials, and the luggage pros at RIMOWA created a miniature version of their iconic suitcase to house them all. The result is a travel kit that looks great on the outside and has all the ingredients to make sure you do too. The Aesop + RIMOWA Köln Travel Kit includes the essentials you would expect – shampoo, conditioner, body wash, mouthwash, and toothpaste – as well as a body balm and three Parsley Seed Skin Care formulations to combat the stress and mess of travel. Each item is a luxurious addition to your existing hygiene regimen, not a subpar stand-in for travel purposes. And they all fit neatly into a custom-build wooden inlay, keeping each piece intact and ready to grab inside their high-end aluminium case.